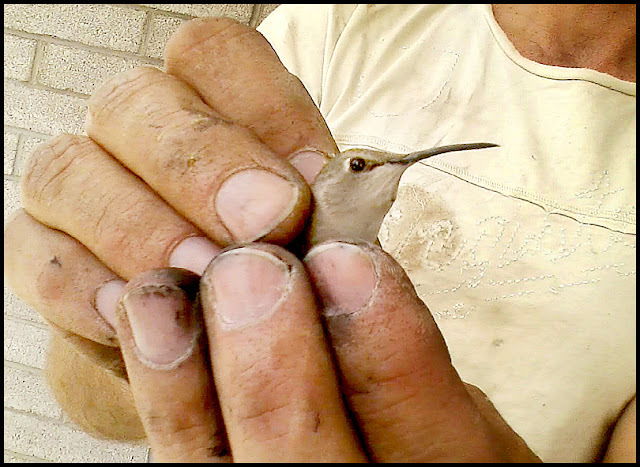 Andrew Henry says: As you might surmise from the condition of my hands, I was outside working on my old truck when Jeanette informed me there was a hummingbird in our kitchen. I went in and gently scooped him up, brought him outside and set him free. I could feel his little heart beating very fast. Also, he peed on my hands. This is the second time I have held a wild hummingbird, they are extremely lightweight. Jeanette says: I love that his hands are all dirty and beat up from fixing the truck, yet they hold that sweet bird so delicately. That about sums up Andrew Henry to me. I so have a crush on him. PS - this is the THIRD bird that has flown into my house in the last two weeks. Sorry for the poor photo quality, we took it very quickly with our phone so we could let the poor thing go as fast as possible. Can't say it any better than Felicity did - Precious - the bird and the man! You three are SO SWEET!! Sweet pic... Your man is so cool in so many ways.. Lovely to see a happy so in love. Purple. cheers to you both. Oh my goodness this made me catch my breath. I had a hummingbird trapped in my house once. Took me several hours to get him out. Finally I stood by the door with a clump of lantana in my hand and he flew right up to me, I could feel the force of his wings as they beat just a few inches from my face. The most amazing feeling ever. My goodness what a wonderful photo. Thank you for your lovely comments on my blog ... much need today. i had to rescue a hummingbird from my neighbors house last year. i gently wrapped it in a towel first and it felt like there was nothing there! sweet little birds! your hubby is a good man! and funny, too. So glad he rescued that sweet bird. We have cardinals on our cars all the time. This makes me smile and makes my heart melt. Oh how the manly man can be so loving and gentle.